The Convert method of a value converter is used to convert from a binding source (e.g. a property) to a binding target (e.g. the attribute of a control). Below is a simple example, showing how we can convert from an integer to a brush of a particular color. 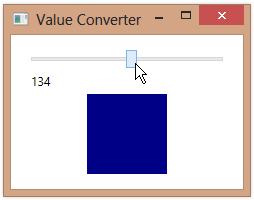 In XAML, we have a Slider that ranges from 0-255 and binds to a property, storing the integer value that the user selects. We then bind to the same property for a rectangle shape’s Fill property. 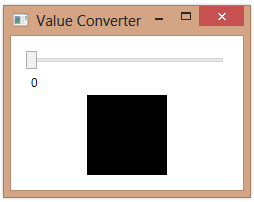 The Fill property wants a Brush object, so we use a value converter to convert from the integer to a brush. 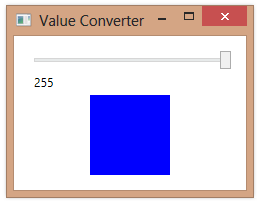 In the value converter, we create a solid color brush whose R and G values are 0 and whose B value is derived from the integer (slider position). At run-time, the color of the rectangle changes as we move the slider.